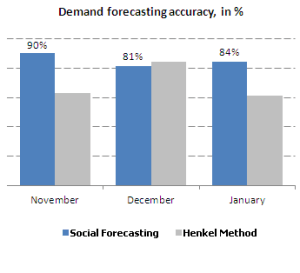 After traditional methods yielded unsatisfactory results, Henkel – which owns some of the most valuable European CPG brands – decided to leverage the collective wisdom of its employees to increase forecasting accuracy by using an internal prediction market. Forecasting sales in the volatile market for fast-moving consumer goods is a huge challenge. A variety of factors such as advertising and discounts can change demand of a product line from week to week. The problem is aggravated for new products that have not been tested in the marketplace yet. After traditional methods of forecasting sales yielded unsatisfactory results, Henkel – which owns some of the most valuable European CPG brands for detergents and beauty products – decided to leverage the collective wisdom of its employees to increase forecasting accuracy by using an internal prediction market. Prediction markets originated as an alternative way to forecast results of political elections. Participants can place bets on specific outcomes similar to sports betting and get a pay-out depending on the accuracy of their estimates. Prediction markets have outperformed other forecasting methods in numerous elections exemplifying the “wisdom of the crowd”. Today, prediction markets are used in a variety of fields. Software companies like Google and Microsoft were among the first to implement them in order to source and aggregate information dispersed among their employees. For example, Microsoft used an internal prediction market to assess whether the company will meet the scheduled dates for new product releases. At Henkel, a subset of its 50,000 employees from the supply chain, sales and head office departments are invited to participate in a prediction market to forecast sales figures on the company’s intranet. Participants can individually select one or multiple product lines and are then asked to make a forecast for the following eight weeks. Employees receive a fixed amount of virtual currency each month that they can use to place bets on their predictions. They can also see the current consensus before allocating their bets. The more accurate a participant predicts actual sales the higher the “pay-out” will be at the end of the month. Henkel uses three main levers to incentivize participation. First of all, every month the top 10 participants are rewarded with coupons in the three-digit euro range or other prices such as iPads. Second, rankings honoring the most accurate and most active participants serve as public rewards on top of monetary incentives and there is certainly a “gamification” element. Third, actively participating in the forecasting process can be motivation per se. Employees in big companies like Henkel often complain that they are rarely asked for an opinion even though they are in close contact with external stakeholders on the ground and hence possess highly relevant information. The biggest benefit for Henkel is obviously having much more accurate sales forecasts. The company claims that using an internal prediction market resulted in a 16% higher average accuracy in forecasting sales. As a result, Henkel can better adapt sourcing and production in line with actual demand and avoid expensive stock-outs. 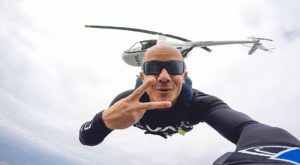 The company claims this resulted in an annual double-digit million Dollar EBIT increase per region. However, its prediction market is not always better than more traditional forecasting methods as illustrated by the graph below. One of the main challenges for Henkel is keeping up a high level of employee engagement on its internal prediction market. The monetary incentives might be too low to drive participants back once initial excitement has leveled off. Given the impressive financial impact on Henkel’s bottom line there seems to be enough room to increase pay-outs and maybe switch to cash instead of coupons to provide more meaningful and instant rewards. Another issue with Henkel’s prediction market might be that forecasts become “self-fulfilling prophecies”. Expecting higher sales due to the current consensus forecast, a salesperson might spend more time and effort on selling a particular product leading to in fact higher sales. This problem could be mitigated by disclosing the crowd’s forecast only in hindsight. Overall, internal prediction markets seem to be a great tool to complement more traditional methods of forecasting. Why have only few companies adopted it? Maybe it’s because few managers are willing leave the powerful tool of forecasting to their employees – even if their collective wisdom leads to better results. 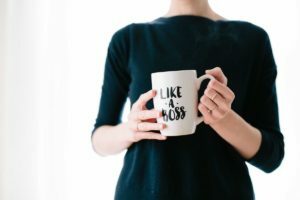 – Is the employee participation sustainable? – Does it yield better results over a longer period of time? If that is the case, this methodology can be applied to a lot of other corporate settings. Especially the fact that it solves the “we are not heard by management” problem could be a really nice side effect of this crowd intelligence!